The HP DreamColor LP2480zx is a top-of-the-line color-critical monitor that retailed for $3500 and features some really impressive specs, such as a true 10-bit IPS panel, hardware-based calibration, and an RGB LED backlight. Unfortunately, these monitors eventually develop a purple/magenta color cast over the entire screen and calibrating with HP's proprietary solution does not fix the problem. I got my hands on one of these monitors on eBay for around $100 (so around 3% of the retail price) due to the aforementioned purple-tint issue and set out to fix it. Here is my journey. True 10-bit IPS panel which allows for not 50, not 256, but a whopping 1024 shades of gray and a total of over 1.07 billion colors. The modern-day DreamColor monitors are inferior since they use 8-bit panels with dithering (AFRC). RGB LED backlight which allows for adjustments to the white balance of the display without any loss of color resolution and compensation for wear over time (at least in theory... more on this below). Extremely wide color gamut which exceeds "wide gamut" Adobe RGB and nearly meets the Digital Cinema P3 gamut. This monitor will display colors that most monitors simply can't. "DreamColor Engine" which performs hardware-based calibration of the monitor. This is accomplished via matrix multiplier which allows for some rather sophisticated color transformations. Color space presets can be quickly selected via the press of a button and are meant to be programmed in via a proprietary calibration probe and software, ensuring accurate colors throughout the life of the monitor. A-TW polarizer which greatly reduces "IPS glow", where colors appear washed out when viewed off-angle. You can clearly see the difference between a monitor with and without it in the picture at the top of this page. The monitor uses an LG LM240WU5-SLA1 panel with an RGB backlight. Since LEDs can age at different rates (which causes colors to drift over time), LG thoughtfully included a color sensor and a color processing chip (Avago HDJD-J822) to maintain uniformity of colors. This allows the rest of the monitor's electronics to not worry about backlight drift – in fact, the backlight module accepts absolute Yxy coordinates instead of RGB for colors, which HP's circuitry uses to set brightness and white balance. Unfortunately, the sensor in these panels goes bad within a few years. The failed sensor measures excessive amounts of green and compensates by turning down the green LEDs. Since there is no way to set individual RGB values for the backlight using the panel's interface, HP's circuitry is unable to compensate for this. The best it can do is utilize the DreamColor engine to calibrate the LCD panel, but after a certain point, there simply isn't enough green light for it to meet the characteristics of the desired color space and calibration fails. The purple color is seen at all times, including the "Scanning inputs" message that displays as soon as the monitor is powered on. The whole scenario reminds me of a Douglas Adams quote. There is no way for monitors using this panel to adjust individual R/G/B values of the backlight, whether via proprietary calibration solution like the DreamColor or manual adjustment like most other monitors, because the panel simply does not provide the appropriate commands to do so. (Even LG's own W2420R has an RGB adjustment limited to requesting Yxy coordinates, which would be inaccurate due to the failed sensor.) The sensor that was intended to maintain the backlight's color uniformity over time ended up making the problem far worse. I read through the datasheet of the Avago color chip and determined that it used the sensor's inputs to drive PWM outputs to control the actual backlight. The system normally operates in a "closed loop" mode where requests for a particular color are modified based on what the sensor is reading. At the factory, the system is put into "open loop" mode and an external colorimeter is used to measure actual values; this data is stored in the chip and is used for calculations during normal use. 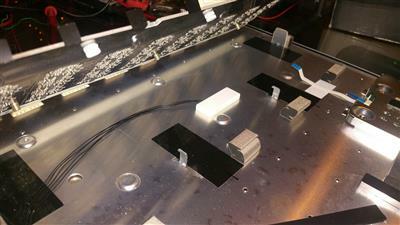 After disassembling the monitor, the first step was to unplug the sensor from the LED driver board. I didn't have very high hopes but I powered on the monitor. For the first time, I saw a pure white background in the "check video cable" message, instead of a purple-tinted one. Success! Unfortunately this was short-lived, since any attempts at adjusting the monitor's settings (or even leaving it alone for a bit) resulted in each backlight color fading to a single channel within a few minutes. Only a complete power-down of the monitor would bring back the brief white backlight. One possible solution would be to modify the factory calibration data on the chip. Unfortunately this would be a short-term solution since the color sensor would continue to wear out (and this wouldn't work if the sensor aged too far). I also lack the equipment and skills to remove and reinstall a surface-mounted chip in order to send it the necessary I2C commands, and the datasheet isn't clear on how to format the data. Another possible solution would be to use a variable resistor to compensate for the sensor's output. I did not have success with this (splicing the resistor into the green channel). Due to the system operating in a closed loop, having the resistor even slightly off would result in similarly invalid results. At this point I realized that the only feasible option was to directly control the backlight via PWM, bypassing the Avago color chip entirely. I had an Arduino at my disposal (which allows for several channels of PWM). Lacking any real tools for surface-mount work, I used an Xacto knife and needle-nose pliers to break the PWM output pins off of the chip, and then (after much trial and error) managed to solder 3 wires to the pads underneath it. This was the point of no return. I wrote up a quick sketch to cycle an RGB LED through the full color spectrum and uploaded it to my Arduino. Then I plugged the Arduino into the monitor's USB hub, attached the wires, and turned it on. I was not expecting much, but to my surprise, the monitor powered up successfully and the "Check signal cable" message displayed with a fading rainbow of colors! In order to control the backlight, I created a simple Arduino sketch to hold the 3 PWM pins at a specific value, then listen over serial for new values. I also created a front end application to allow easy control from Windows. To keep things simple, I hard-coded default values (which are applied every time the monitor is powered on) but I could improve the functionality by allowing the Arduino to save those settings. The Arduino fit nicely into an empty space near the cooling fan, although the USB plug was a bit too long. I held it in place with tape. I ran the USB cable through a small hole I made in the outer casing of the monitor and plugged it into the hub on the side. This provides the Arduino with power and allows the computer to communicate with the Arduino through the uplink port. Since the color chip has been bypassed, the monitor's brightness and white balance controls are no longer functional. The only way to adjust brightness is through the app. The 3D LUT and matrix multiplier are still functional, however, so it should be possible to calibrate the monitor in hardware and use the color profiles. I'm not sure if the official HP Advanced Profiling Solution will still work as I do not own one. The Arduino is unable to output a high enough PWM frequency. Thus, the backlight flickers very noticeably unless it's near maximum. Near the lower end of the range, it looks like a strobe light. This is the biggest downside of my solution at this point; perhaps I can find a better microcontroller with a higher PWM frequency. Since the Arduino is powered via USB, and the backlight is now entirely dependent on the Arduino's PWM signal, the USB cable must be connected at all times. This uses up one of the four USB ports on the monitor. Here is a demonstration of the final product. If you'd like to attempt the mod yourself or look at my code, you may download it here. I have the same issue my LP2480zx. Congratulations for your work. I want to try your solution. I'm not samiliar with Arduino but I can solder pretty well, even on those tiny chips. Could you do a step by step tutorial to perform this repair procedure ? In particular, identify the points to solder to the Arduino Board. @Unic I used the HDJD-SCR00 datasheet to determine which pins were the PWM outputs (pins 14 through 16, see page 3). I used wire from a floppy drive ribbon cable with some solid wires soldered to the other ends. For the Arduino, you don't have to solder anything. Insert the solid wires into the Arduino's output pins 9 (red), 10 (green), and 11 (blue), then upload the sketch linked at the bottom of this page and run the included control software. Indeed, with the datasheet that is more clear to me. To be clear, I have to cut the pins 14, 15 and 16 of the chip and after solder theses three wires to the board underneath. @Unic Correct, you want your wires to connect to the board (and not the chip). Be sure to insulate the wires from the chip so they don't contact the Arduino circuit. Any Arduino board marketed as an "Uno" should work (whether genuine or knockoff). I ordered an "UNO R3 ATmega328P Development Board With Boot Loader For Arduino UNO F7" for 3$. I messed up de-soldering one leg of the chip (one pad broke), so I choose to solder the wires on the smd resistors. Some pictures of my intervention. After taking this photographies, when bending the wire, one of of theses smd resistor unsticked of the board. The one corresponding to the pin #14 (PWN_B). No luck again. So I decided to solder the blue wire to the pcb board point near marked as "PWNB". I placed a 1k resistor to this point (replacing like this the smd untiscked) and soldering the wire to this resistor. And it worked fine ! The HP DreamColor LP2480zx colours are now fine. Thanks. I was not able to use your program "Arduino Dreamcolor.exe". When I launch it. Windows tells me that is not a valid application. I surely miss a step. Do I have to install another program before launching it ? @Unic Make sure you have the .NET Framework 4 installed. Which version of Windows are you using? I running on Windows XP 32 bits and I have .Net Framework 4 Extended installed. @Unic Did you try building it? I didn't actually intend to release the binary but it looks like there is one in the "obj" folder. It's possible that the binary is built for 64-bit Windows only (since it's not an actual released exe). I can build you a 32-bit one if you can't get the source code to build on your own. What software do I have to use ? I do not possess the skill or patience to tackle this. Let me know if you'd like to purchase another monitor. I have one with the HP Dreamcolor Calibration System tool. I have 6+ years old LP2480zx. I bought the original in 2008 which stopped working in 2011 and it was replaced by warranty. I have a poor colour vision, but even I can see the white point has shifted towards purple. Backlight hours is about 13000. I haven't been able to complete the calibration reliably for many year and been to frustrated to even try most of the time. Nowadays the original v1 puck model calorimeter produces wrong calors because its filters have evidently faded. I am now ordering the v2 model which has sealed filters and hopefully longer life. I would rather consider replacing the sensor chip than doing my own PWM. This requires removing the old sensor chip with soldering station with heat blower and replacing it with new one, perhaps baking it in soldering oven. Another option is to build a new sensor board. The sensor board has one sensor chip, one capacitor and one connector with 5 pins. Shouldn't be totally impossible and it wouldn't have to be pretty. Yes, changing the sensor chip shifts factory calibration. One could compensate this by adding an adjustable gain voltage follower for each 3 channels. This would be basically be one quad op amp chip and additional parts. The gains would have to be adjusted to match the original sensor chip sensitivies at the time factory calibration. Mismatching sensitivities would show up as white point being in other position than desired. Kynix at Hong Kong seems to sell HDJD-S822-QR999 sensors at single chip quantities for about USD 5 each, shipping costs USD 35. @Jarkko Lavinen Definitely, a successful sensor replacement would preserve more of the monitor's functionality and would avoid the flicker problem I had. If you end up succeeding in doing the sensor replacement, let me know how it turns out! @Gerard If the price is right I'd consider attempting a different repair (the color chip replacement) on a second one. I bought a used DreamColor mark 2 calibrator. Using that I was able to calibrate better than with my old puck but white point was still off from desired. I am surprised the HP/X-Rite calibration software now works when few years ago it failed no matter what I tried. I used Dispcal from ArgyllCMS to check the white point after calibration and then compensate for the difference between desired and measured white and calculate new coordinates and re-calibrate. Fortunately the HP calibration software allows using custom white coordinates. I had to repeat the calibrate-compensate cycle many times. To get D65 at xy coordinates 313 329, I now use custom values 327 320. So I don't have immediate need to replace the color sensor. I have nevertheless ordered few sensors from Kynix and I now have SMD rework station. Possibly the change of factory calibration of new sensor chip could be compensated with just using custom coordinates. @Jarkko Lavinen That calibrates it using the LCD. If you display a white background on the monitor and then open the OSD, you'll unfortunately notice that it is purple in comparison. I'm curious to hear some of your updates. I'm waiting on my Arduino Uno to arrive. I am a complete newb when it comes to electronics, but I'm willing to learn and give it a try. I ordered 5 sensor chips. The chip is very small and it is difficult to see where the pin 1 is. Pins 14 and 15 are not connected and this can be seen in a macro shot. Pin 1 is on the left side the same way as in the data sheet. I have a hot-air rework station but would need a lot of practice with scrap boards until attempting to replace the sensor. Tried also to get Ookala calibration software (from Sourceforge) working but I does only work the original version of LP2480zx where all traffic went through DDC. Onlu simple commands work now over DDC but table reads and writes do not and crash the monitor. In the newer models there is a proprietary USB-i2c bridge. I have tried to sniff the traffic and but again can only do simple commands. I was able to adjust the backlight manually by cracking open the display and physically tapping on some minus green gel to the sensor ( 1 and 1/2 was pretty close) (Rosco 3308 and 3309). Interested in more updates from you guys. Just got my hands on a lp2465 and lp2480zx and wondering what to do with them. The 2465 has a damaged panel (looks like dead pixels) and the 2480 has the color sensor issue with purple screen. I'd like to just replace the sensor to avoid the screen flicker but not sure how hard that would be and if a hot-air station is required. @Peter Mickelsen That's really cool! Do you have a picture/video of how the monitor worked out in the end? @quiksilver The sensor itself is on a breakout board as pictured. If you could build an equivalent board and mount the new sensor in its original hole, it should be doable without hot air. Unfortunately I don't know how well it would work if you can't set the factory calibration. Sorry if I sounds stupid, is the color sensor part of LM240WU5 panel or something HP added later on? I'm trying to consider the possibility to replace the entire panel since I'm not electronic technician. It would be great if you can offer some insight to tech-noob. @Jimmy it's part of the LG panel unfortunately, and that means that even HP didn't have a supported way to adjust the colors (the panel accepts absolute Yxy color coordinates and relies on the sensor to keep them accurate, even though a faulty sensor just makes the problem worse). @Jimmy Replacing the panel will only delay the inevitable problem and could even have it from the start if the sensor is old enough (not sure if it wears out due to age or amount of light it accepts). At the right price it's worth a shot but when I looked at replacement panels they were around $500 each. 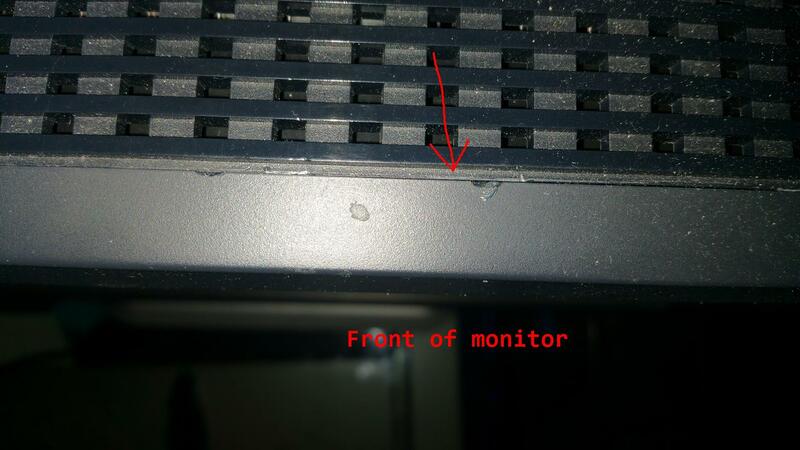 How easily did the rear cover of your monitors come off? On my monitor, it feels as though the back cover is glued on. 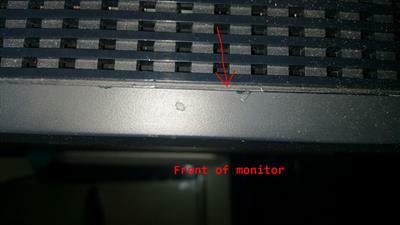 Is there a trick to removing the rear cover of the monitor? @Ben It was a bit of a challenge. Place the monitor face down, remove all screws on the back, then gently pop out the edges of the cover all around by prying between the gap. Once this is done, you should be able to lift the back cover right off -- alternatively, flip it over and pull the front bezel off (but it will then be difficult to flip the monitor over without damaging the LCD). Be careful with the cable connecting the front-panel buttons. See the image below. Stick your pry tool (a putty knife or flat screwdriver works) under the "lip", pointy end towards the front of the monitor (i.e. downwards if the monitor is lying face down). After finally getting the LP2480zx open (with the help of this video: https://www.youtube.com/watch?v=RgErQwXrVSw), and eventually figuring out where the light sensor was hidden (and boy is it small! ), I ended up doing the "Peter M Method" by using one of the Rosco Minus Green gels. I ended up just taping on a little tiny piece of the gel using regular clear packing tape (don't know enough about electronics to know if this is a terrible idea or not). Plugged the monitor in to test and it works! Now I just have to summon the patience to put the monitor back together. For anyone wondering where to get the gels, I ended up purchasing the "Rosco Cinegel Swatchbook" from B&H, and it had more than enough samples to potentially work with. Thanks to nookkin and everyone else for all the help! Hopefully this monitor will last me a year or two more! @nookkin I brought the panel on a Chinese site. It took about a week to ship it from China to US. The panel is surprisingly cheap( about$120), but the shipping cost is relatively high($70). I spent three hours to disassemble and put the monitor back, but the result is worth it. Though, the panel has one dead pixel that's only able to show green and white colors. The color looks perfect, sad 3rd gen dreamcolor is total garbage comparing to 2nd gen. I spent total $300 on this monitor in case you need the reference. I recently acquired two of these failed LP2480ZXes, but where exactly is the color sensor located within the monitor and panel? I aim to perform the gel filter mod mentioned in Ben and Peter M's comments and just want to save a bit of time before I take the time and effort to tear these apart. 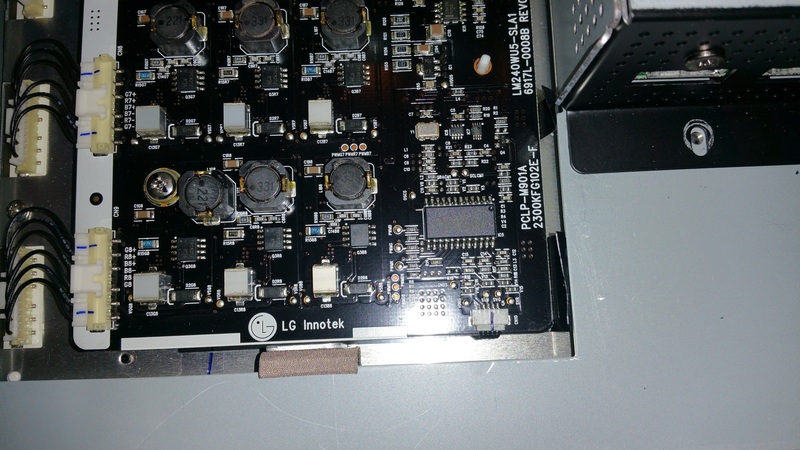 @Nuw It's on the back of the LG panel which unfortunately requires almost complete disassembly of the monitor to get at. You'll need to remove a metal cover. The sensor is under the white thing with the wires coming out. Ok, so it's been about a month since I've "fixed" the monitor with the color gel hack, and while it's not perfect (there is still a slight hue), the monitor is much more bearable. At first, I thought taking apart the monitor and performing this particular fix would be simple, but this monitor is one of the most complicated monitor's I've come across (taking it apart, the amount of hardware involved, working with the sensor itself, and putting it back together). At first I thought if this hacked worked well it would be worth getting a few more monitors as backups. Unfortunately, while this monitor is still one of the best monitors i've ever worked with, the price of newer 4k AdobeRGB monitors is coming down, so I don't think it is as economical of an option as I first thought it would be. In any case, I'm looking forward to potential updates on other users' solutions! The color filter mod was actually rather successful, but I noticed that the white point would need shifting or the display would end up cycling between red and blue in one case. Further, brightness controls were essentially nonexistent. Removing a bit of filter fixed that for me. My other LP2480ZX also benefited from this mod but still has a haze; I plan to address that with more filter this weekend. I'm also curious as to how to get internal calibration to work without HP's scarce and questionable i1d2-based calibration solution. I did Unic's method as seen in the photos he shared. Broke the three pins and then soldered on the "smd resistors". The monitor powers up and OSD buttons light up but no screen or menu - blank and black. Any ideas? Was I suppose to remove the sensor? Update: I installed the Arduino software and uploaded the script, plugged it in and the monitor turns on now. Looks great right out of the gate - EXCEPT it's flickering quite significantly . How do I reduce the flicker? How to I activate the windows RED GREEN BLUE menu? Update 2: In the Arduino script I found the right values to achieve a white balance, the flickering is gone. Ran displaycal successfully and the contrast and saturation looks great. The problem I am facing right now is that it has become apparent that the white balance is very inconsistent across the screen. Green bands and red leaking. Most notably on the upper half and on the left side, facing the monitor. @user91820 The Arduino fully controls the backlight so it needs to be plugged in and holding the output pins at some PWM value. It will flicker like crazy at lower brightness due to the Arduino's low PWM frequency. I have to keep mine pretty close to full brightness to make it go away. If you want to use the Windows menu, download the Arduino DreamColor Fix zip file. I added the compiled EXE so you don't have to compile from source. Do you have a picture of the inconsistent white balance? It's possible that someone calibrated it as far as it could go with the purple -- I would test white balance settings using the "Monitor Going to Sleep" error which is "immune" to the DreamColor calibration. Unfortunately it's probably cheaper to buy a replacement "purple" screen on eBay than to repair the current one. Hey thanks for the quick reply and adding the compiled program! I’m not at home right now, I will send a picture later today! How do you test with the monitor error? Right now the monitor is set to factory settings. I have both the new and old HP calibrator units and I ran them for calibration with the HP DreamColor Solution software before your Arduino mod. Both calibration units failed, the old school puck made everything red and the new dp1 or w/e it’s called made everything slightly green and the brightness dim. Using your Arduino I basically had to boost the greens a lot and boost the reds and blues a bit too. I can send a screen shot of the white balance measurement on display cal later today too. @user91820 The various menus/errors on the monitor are not subject to the calibration. You can briefly see the "Monitor going to sleep" error if you have no inputs selected. Alternatively you can set OSD transparency to 0 and use the white/gray OSD colors while displaying a white or neutral gray signal. Another possibility might be to bypass the DreamColor Engine by feeding the monitor an interlaced or YCbCr signal -- either do this digitally in your graphics card's control panel or use the Composite input with only the green (Y) plug connected. You'll know when you receive a "Color Gamut Remapping Disabled" message. See if there is a noticeable change in white balance with constant backlight settings via Arduino. Can you try calibration with all PWM channels on the Arduino set to 250 (maximum range my Windows app supports)? I'm confused as to what you want me to do with the OSD menu with transparency set to 0. You want me to put the calibration unit on that and get a white balance measurement? Is that what you wanted? I then ran the calibration and I think the white balance is a bit more consistent now. However, I can still see that the upper 1/4 of the screen is ever so slightly red and the bottom 3/4's is ever so slightly green. At a second glance it almost looks more like the bottom 3/4s is just too green and the upper 1/4 is probably about right. PS: The flickering is very sensitive when changing the green channel. Even dropped down to 240 and flickering is significant. Reducing the green channel in Arduino to 200 (for example) seems to really improve the white balance of the monitor tho? What is going on here? What is the relationship between the flickering, the green channel being lowered and this improving the white balance of the screen? Hey man! Thank you for what you have done here, I'm moved on past the slight white balance inconsistency. Wondering if you know why when using HDMI as the input I no longer have color space options (ex. REC709). It is locked to "full". Ideas? Hoping to use REC709 in Davinci Resolve! @user91820 The DreamColor Engine only works with a progressive RGB input. Change your settings back to RGB in the graphics card's control panel and you'll get it back. @nookkin Hey! Thx for tip, turned out it was because I didn’t have 444-SDI box checked in resolve. Outputting to LP2480zx via HDMI and Blackmagic mini monitor 4K. Your expertise saved this screen, allowed me to get off the phone with HP and avoid settling for a 6bit panel from Viewsonic! Thank you for your efforts, god bless you man! you receive a new panel with the stuck pixel or was a refurbished one? The LCD panel has the color sensor? A friend give me this monitor for free because of the purple issue. He said he can not fix it. I want to give a second chance to this excellent monitor but I do not have any electronics or soldering skills to make this mod with arduino. I think is a better option for me just to replace the LCD panel if that fixes the issue. Can you tell me what happened in your case? Four months later, I've "re-fixed" one of my three LP2480zxes with an Arduino (Sparkfun's Pro Micro-based) directly controlling the backlight. Earlier, I had used the gel filter mod described in the comments, but this particular monitor (with 38,000 hours!) never seemed to do anything but color-shift until giving up, even after sanding down the color sensor in an attempt to get more light into it. I'll look into ways to increase the PWM frequency from here to above 610Hz (according to datasheet, the HDJD-J822's PWM output runs at that freq. in a "typical" setup), as well as perhaps making a better program with user-controllable color temperatures/brightness presets that might also work on Linux and Mac OS. I might probably just end up making manual hardware controls so I don't really have to deal with programs in the first place. I much prefer manual control. @Nikolai It's new except the stuck pixel, which only show up if the background is black. The color sensor actually comes with the panel originally. The panel is designed and manufactured by LG but it seems like 2480zx is the only commercial product that uses this panel. 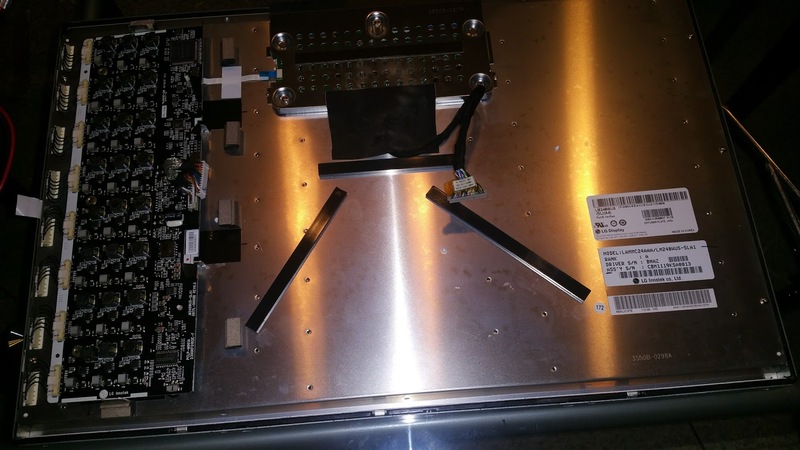 The panel comes with its own circuit board, so just disconnect the cable connecting to monitor's control board and replace the panel afterwards. It's pretty simple, took me about a hour and half to disassemble and put it back. The plastic frame is the most difficult part, the rest is just unscrewing the panel, also make sure not to break anything. I brought it from here, just in case if you want to know. I'm using the HP DreamColor as a third screen dedicate to movies. After the Arduino mod, the impossibility to adjust the brightness is my main issue. I wonder if a hardware ajustement like this one can be done to adjust the backlight intensity ? @Unic The hardware trick is to tweak the output current of the LED driver. I did not find such a chip but that's not to say it's impossible. Keep in mind it's a full-array LED backlight, not just a strip or two at the edges. There are multiple groups of LEDs driven independently by their own set of driving circuitry. You would likely need to replace multiple resistors with identical ones or you'll end up with uniformity issues. If I interpreted the picture correctly, the mod can be done very easily. Adding a same value resistor to each "+" cables that comes from that board to the backlight panel. The issue is just to know how much intensity (mA) every led liaison has, that way I can calculate the resistor needed. For the voltage, that no problem. Maybe I'll give a try. @Unic The article you linked to describes using a small variable resistor to control the output voltage of the driver IC (using the "compensation" input pin which is meant for voltage adjustment). This replaced a fixed-value resistor installed at the factory. If you connect a resistor in line with the + pin, you'll need a much bigger (high wattage) resistor since it will consume some of the current meant for the LED and convert it into heat. If you use something that can't handle the current, it might catch on fire! I like using external circuit to control backlight as it is very 'hacky' solution and can be used as last resort option. I would however use FPGA instead if I had to. Thankfully my two LP2480zx can be calibrated using HP calibrator just fine. I have 13020 hours on mine I am using now and 4561 hours since last calibration and white is still perfectly white. @Pawel Mine has 32,468 hours. 4,000-ish is practically brand new. As long as the backlight is able to produce sufficient levels of green, you'll be able to calibrate (via DreamColor Engine that only manipulates the LCD panel) successfully but calibration will fail once the backlight doesn't produce sufficient green light. Does it look white compared to a known-good monitor? I have no experience with Arduino but I do have experience with inline PWM dimmers with custom LED units Ive made. Would it be possible simply to install inline PWMDs for each channel and using a calibrator, dial it in this way? 1) Can you identify actual # of hours? 2) Last Calibration shows 2272 hours....Is that decent? 3) I have connected to a IMAC 2017 and am only able to access "Full" (Similar in Nature to Erik's question above) Any thoughts? 4) Screen looks pretty good but the clarity and sharpness of text from the Mac Finder menu for example, is not great. But the text from the 2480 Menu looks crisp as can be. Any Thoughts? 5) Last but not least...Anyone willing to rent/sell/borrow the calibrator? I will take care of it like my own child. Thanks everyone for the posts...Nookin, U R A BEAST!!!! @Matthew Macar You should be able to do this by connecting directly to the PWM pins as described in the article and/or comments. Same downsides of the Arduino mod would apply but the PWM dimmer could be better at avoiding flicker. If you try it, please share the results! I don't think it will work to connect to the color sensor though, since it outputs analog and not PWM. 2) Last Calibration doesn't matter as much as total backlight hours as far as the purple issue is concerned. 2,272 hours is quite young for total; mine is at 32,696. That being said, it's possible someone cleared the memory. 3) If you're stuck on "Full" it means the DreamColor Engine is disabled -- and it does that when it's fed anything other than a progressive RGB signal. (So YCbCr and Interlaced will both do this.) What input are you using? I'm not super familiar with Macs but you should be able to find a setting to put it into RGB mode or "monitor" (as opposed to "television") mode? 4) See #3, it's the same root cause. It thinks it's getting a "TV" signal and tries over-sharpening it to compensate. 5) Unfortunately I don't have one. Even if you do find one, the filters in them wear out within a few years so results are not guaranteed. Is there a way to access the sensor board without removing the main board? Or how do I remove the backlight board? It has 3 screws. One of them is behind the USB PCB pedestal. Detaching the LCD signal cable from the main board seems impossible without damaging the cable at the same time. I was able to remove the back panel relatively easily but not that cable. @Jarkko Lavinen You need to remove the entire panel unfortunately.See this comment for pictures. The signal cable is sitting extremely tight as if it were glued. I have tried 3 different pliers in vain and with high risk of damaging the cable. I would need some small wedge to force it to separate. If you were to look at the color sensor, the one that you removed from the monitor... the one that causes the problems with the monitor.... you could fix the sensor in like five seconds. The reason the sensor goes bad is because the HP guys put some sort of epoxy on top of the actual sensor.... the epoxy goes green over time, and the sensor compensates by making the monitor magenta (as the sensor is essentially seeing everything green). The solution is to grab an x-acto knife and remove the green epoxy from the top of the sensor... it will crack and peel off. Do it carefully so that the sensor is not damaged. Put the sensor back inside, and be happy, the sensor will never fail again. I have a dreamcolor with more than 40,000 hours, looking great. Hopefully this solution doesn't come too late to the party. I reckon, I should have commented ages ago. @ercpck Hi ercpck, Sounds very clever and logical solution ... I´ll try and update this post in a few days... Thanks a lot!